Now more than ever, employees start to question whether they want to continue the corporate ladder which was fully ingrained to us as kids or pursue being their own boss and be full time entrepreneurs. It takes courage in deciding to be in the business journey and I’d say our generation (or the younger generation haha) has that tantamount courage to follow their passion. But is entrepreneurship really for you? There are MANY misconceptions about business that those who try that route become disappointed because they thought it was all glamorous. Well no, it is not! It is about time we lay it down the table — the myths about entrepreneurship debunked! 1. When you become a businessman, it’s all play and no work. Nope, not at all! When you become your own boss you should be ready to work harder than anyone else in your team, harder than when you were an employee yourself, work longer than ever before. This is YOUR business. You take it for granted, you won’t have something in your bank account by the end of the month. Unlike with being an employee, whether you work harder or not, you get your paycheck on the 15th. You don’t go to work? No problem, you have paid leave. But as entrepreneurs, the hours you put in is very important. But it isn’t all that bad. Good news: This too shall pass. The beginning stages of every business is mostly the hardest. When Injap and his wife (founders of Mang Inasal) were starting their business, they were the earliest in the store and the latest to come home. When they get home at 10pm, they still need to make the secret sauce for their barbeque until 2am. That was the beginning. But now, everywhere you go, you’ll see Mang Inasal. 2. Being in business will make you filthy rich. Isn’t this the main reason why you went to business anyway?? But how come out of 10 start up businesses, more than half end up closing down in the first year? Because well, the “big” chunk of money won’t come in that quickly. You’ve got to be patient and skilled (!) enough to make big bucks in the long run. Good news: Yup, this too shall pass. Like what I said.. Relax. Be patient. Learn the ins and outs of business and don’t give up. There will be hard days. BUT there will also be good days. Never run out of patience to wait for that day. Starting a business isn’t just about courage. It’s also about knowledge. If you are feeling uneasy about taking the plunge, get some help. Read books. Find a mentor. Attend seminars. Increase your knowledge about the business you are about to do. On August 15, there will be a business seminar that will guide you in starting your business. This workshop has absolutely helped me in setting up my business. 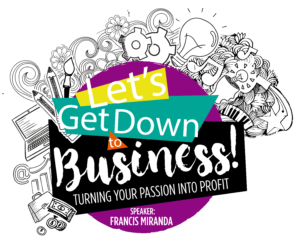 And if you are in that season of wanting to turn your passion into a business, the Let’s Get Down to Business Workshop is for you! Ready to take that leap of faith?? Don’t miss this workshop!